Today 's most elite PC systems feature elaborate custom cooling systems to manage CPU, GPU and occasionally even chipset temperatures. While the process has come a long way in the last 10 years, it still takes a bit of home work to choose the right parts and patience in assembling them a system properly. Fortunately, all in one liquid cooling systems have also come a long way and can can save a lot of time and money as well. Not too long ago, I installed a Thermaltake Water 2.0 Extreme LCS in a GIGABYTE demo system for Intel Lanfest Infernalan. The goal was simple: cool the CPU as quietly as possible without sacrificing overclocking or gaming performance. Even though past experience has taught me that a custom liquid cooling system works better, I've discovered that even the science in these all in one loops have progressed too. If you're considering liquid cooling but don't won't to deal with custom liquid cooling, then our review of the Thermaltake Water 2.0 Extreme might offer you another option. We easily get the idea of exactly what the Water 2.0 Extreme offers from the box information alone. 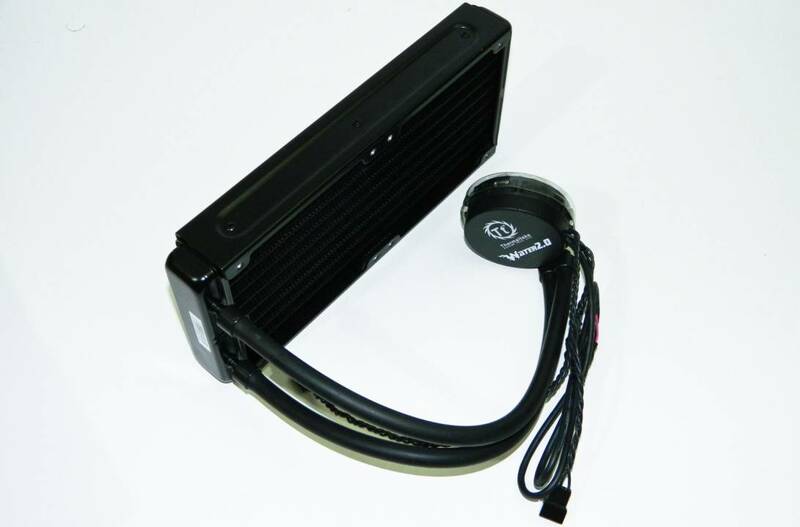 Highlights include the use of a a 240mm light weight black aluminum radiator that is cooled by two 120mm fans that produce a maximum of 81.3 CFM in airflow, within an RPM range of 1200 to 2000. Rated noise levels top out at about 27.5 dBA. The fans themselves are 4pin PWM fans which means they can be automatically controlled via the motherboard's BIOS or with the Water 2.0 Thermal utility which is included with the unit. Control is done via a USB header connected to the motherboard. The Water 2.0 Extreme actually weighs about as much as a performance level air cooler but doesn't share all the shipping risks when installed. That's one of the nicest features in my book especially if you're a system integrator or move your system around a lot. 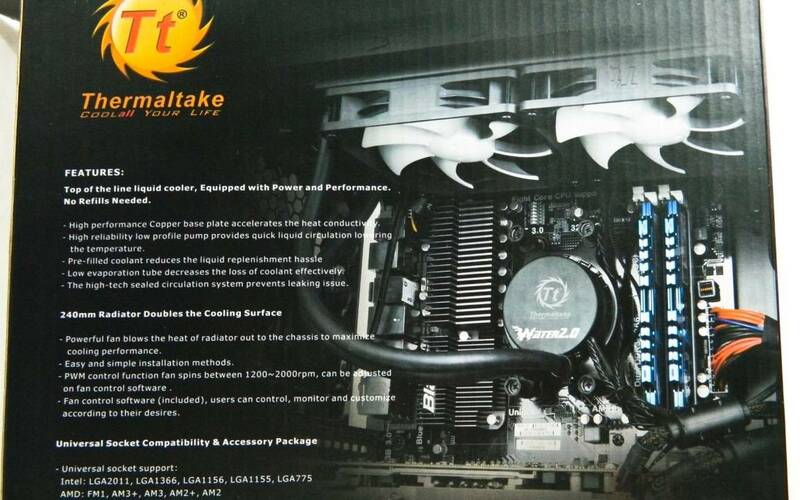 It is also Thermaltake's top of the line in their Water 2.0 series. You can see a quick snap shot of the differences at th bottom of the product page. 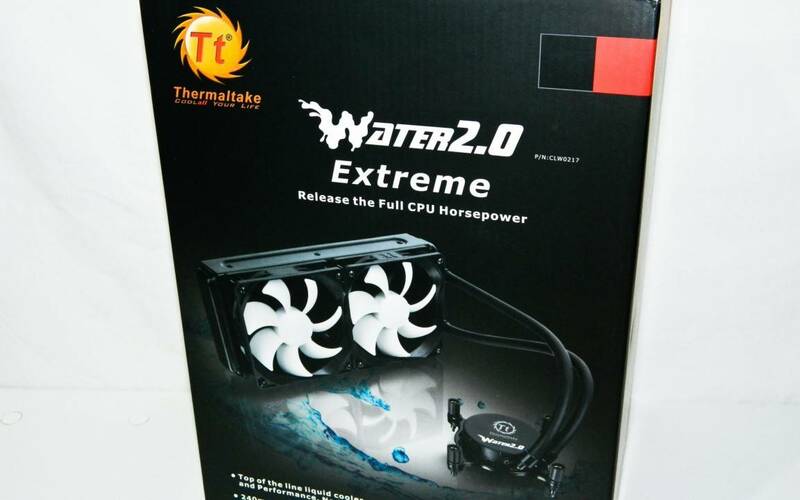 Pricing for the Thermaltake Water 2.0 Extreme is in the range of $117.95 - $139.99 according to our pricing engine. To the novice, the bundle may look intimidating especially in regards to the mounting parts in the bag. You don't have to use all of them. There are parts specifically intended for Intel (LGA2011, LGA1366, LGA1156, LGA115) or AMD (FM1, AM3+, AM3, AM2+, AM2) processors commonly found on the market. The manual is easy enough to follow to install the system in a computer enclosure with proper dual 120mm fan ports at the top of the case. We'll touch more on that in the installation notes to save you some time. 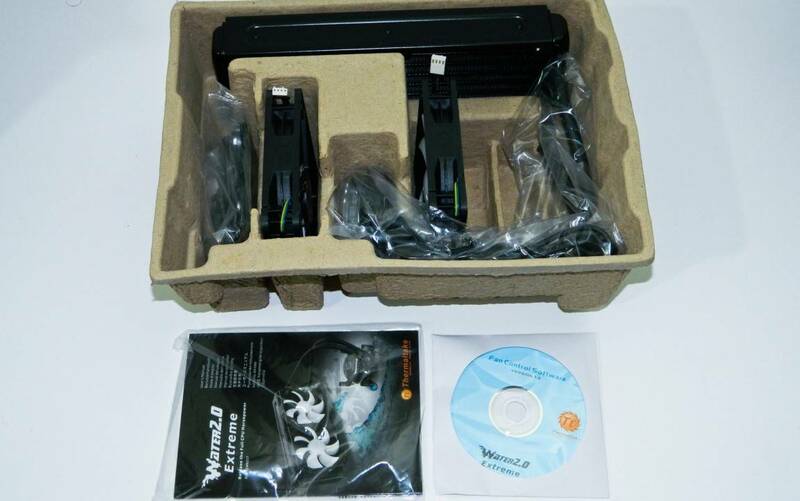 In the box are two 120mm Thermaltake 4pin PWM fans. These are temperature and Thermal 2.0 software controlled fans rated 1200 to 2000 RPMs producing a maximum of 81-82 CFM with a max 27 dB(A) noise level. They are mounted on the 240mm radiator pushing air through it rather than pulling. Machined screws are also included to mount inside your cases. In a sentence, everything is here that's needed for complete installation. While you can't tell from the photos, the 240mm radiator is made with very light weight aluminum. The chassis itself is rigid enough to handle installation without bending but you have to be more careful with the internal fins which bend very easily. The actual pump unit requires a simple USB motherboard header for power which also allows for control of the unit using the aforementioned software. The fans need a single 4pin CPU fan header off the motherboard. Most motherboard BIOS like to see something plugged in to the CPU otherwise you'll have to disable that fan control function to avoid issues. The tubing connected to the cooler is very pliable and is about 326mm or about 13 inches long which makes it easy to position or contort to your computer enclosure. 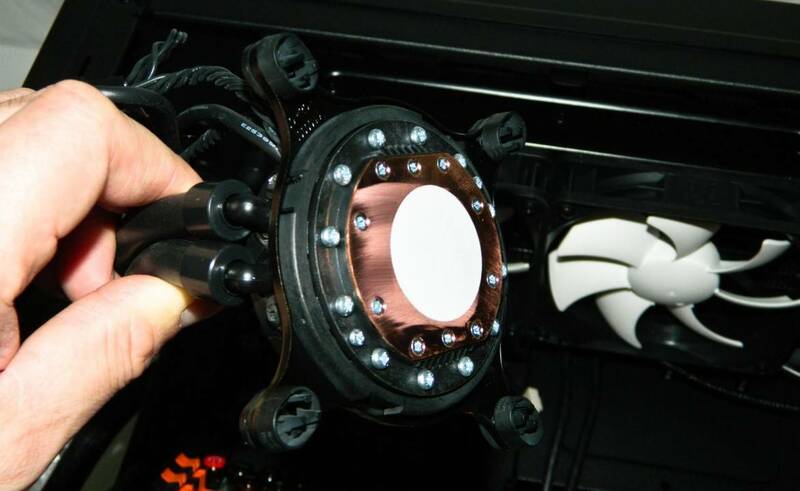 The base copper cooling unit has a built-in pump so there's nothing that needs connecting other than power wires. The copper base is smooth for the most part. You can't feel the ridges to the touch but it's apparent a a circular machine surface was used to achieve the desired finish. Redundant screws have been used to fasten the copper plate as well as the strong black plastic base housing. There is absolutely no chance of leaks without intentional abuse. Motherboard 2: GIGABYTE GA-Z77X-UP7 "OC"
Prime95 and Furmark were both used to push all functions of the CPU to maximum thermal output. Keep in mind that most processors, or systems for that matter, don't run at 100% maximum load unless you're using CPU intensive programs regularly. Ambient temps vary region to region so your results will vary. Before getting to testing, let's cover any installation issues first and our notes for getting out of them. So Who Won The Sapphire HD3 Mini PC System from NCIX PC and Futurelooks?